Check out our useful tips and ideas to help you create customizable products that will elevate your brand. Share photos, shop trends and get inspired. Two ways to print. The choice is yours. For small projects or when you need it now, you can personalize & print our products yourself. For large jobs or when you want it printed professionally, Avery WePrint™ is the way to go. We offer a wide variety of customizable products to help build your business that can be printed from a standard desktop printer. Get exceptional printing on premium materials with no setup fees, low minimum order quantities and delivery in as few as three business days. Easily design and print durable GHS labels right from your printer with Avery® UltraDuty™ GHS Chemical Labels and free Avery GHS Wizard software. Design your label with the FREE Avery Design & Print GHS Wizard software at avery.com/GHS. For more information on UltraDuty GHS Chemical Labels, click here. Fill out the form below to receive a FREE sample of our UltraDuty GHS Chemical Labels. Please allow 2-3 weeks for your sample to arrive. Would you like to receive free offers, product information and news from Avery by email? Limit one sample per person, while supplies last. Avery reserves the right to limit quantities. Offer good in the Continental U.S., Alaska, and Hawaii. Offer void where prohibited, taxed, or restricted. Posting or linking of this offer on any bulletin board, personal Web page, or by other means of dissemination without permission from Avery Products Corporation is strictly prohibited and deemed a violation of Avery’s intellectual property rights. Avery Products Corporation reserves its right to exercise any legal recourse against anyone who infringes its intellectual property rights. We received your request for the Avery UltraDuty™ GHS Chemical Labels sample. Your sample should arrive in two to three weeks and we can’t wait for you to try them. Thank you for your interest in Avery products. For more information on Avery UltraDuty GHS Chemical Labels and to check out the FREE Avery Design & Print GHS Wizard where you can design chemical labels step-by-step, visit avery.com/GHS. 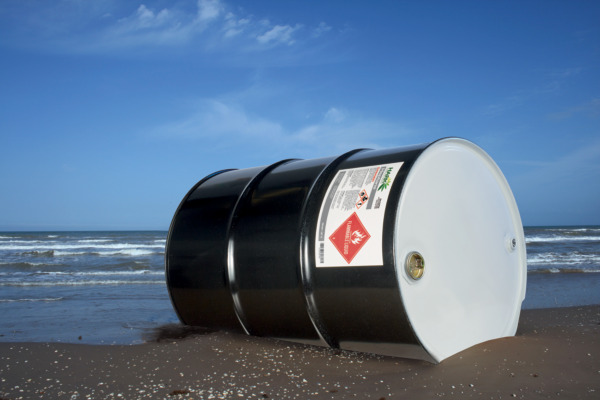 Companies transporting dangerous goods in marine environments (overseas) are subject to safety regulations and may require British Maritime Standards (BS5609) certification for their labeling components. This is a requirement for International Maritime Dangerous Goods (IMDG) certification. The purpose is to ensure that if a chemical drum falls off a ship that the label remains adhered, intact and legible after an extended period in the ocean. Labels need to withstand a three-month salt water submersion. BS5609 compliance means the label has met the most stringent tests for durability in the industry. What is BS5609 Section 2 compliance? Section 2 tests are conducted on the blank pressure sensitive, adhesive coated base material. Testing procedures include exposing to artificial weathering (salt spray & sunlight), dimensional stability and adhesion. The label must remain adhered for 3 months submerged in seawater. When a label is Section 2 compliant, it means only the blank label is BS5609 Section 2 compliant. Avery UltraDuty GHS Chemical Labels are BS5609 Section 2 certified. What is BS5609 Section 3 compliance? The difference between Section 2 and Section 3 is that the printed label is tested, whereas Section 2 is only testing blank label stock. With Section 3 compliance, labels are tested for abrasion resistance and permanence of print. Tests include exposing the label to artificial weathering (salt spray & sunlight), tape removal and abrasion resistance. Avery UltraDuty GHS Chemical Labels are BS5609 Section 3 certified with specific printers and ink/toner. Which printers are BS5609 Section 3 certified with Avery UltraDuty GHS Chemical Labels? Please download and install the custom media table developed by OKI for BS5609 Sec. 3 certification with Avery GHS Labels. 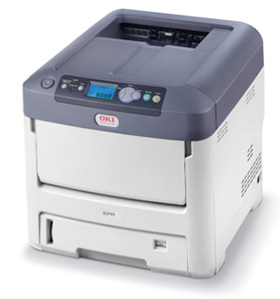 Can I use a standard color laser printer to print GHS labels? Yes, if you are not shipping chemicals in marine environments and do not require BS5609 Section 3 certification, then you can use a standard color laser printer with Avery UltraDuty GHS Chemical Labels and have great durability. This works well for domestic shipments or workplace labeling. For best results, use the Label setting on your printer. 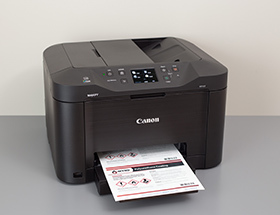 Can I use a standard inkjet printer to print GHS labels? 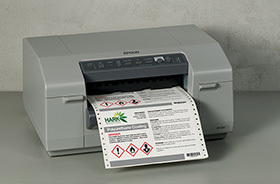 If you are not shipping chemicals in marine environments and do not require BS5609 Section 3 certification, then you can use a standard pigment-based desktop printer with Avery UltraDuty GHS Chemical Labels (Inkjet) and have excellent durability. This works well for domestic shipments or workplace labeling. 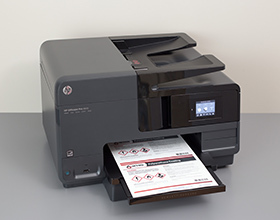 Most desktop inkjet printers use either dye-based or pigment-based inks. What's the difference? Dye-based inks consist of a dye or colorant that is dissolved in a liquid solution. The ink is absorbed into the material on which you are printing. In general, dye-based inks are less expensive and produce more vibrant colors than pigment-based inks. However, they are water soluble, which means they will smudge when exposed to water. They are also prone to fading when exposed to sunlight. Therefore, dye-based inks are not ideal for durable uses. Pigment-based inks consist of a dry, powdery substance that is suspended in a liquid. The pigment ink sits mostly on top of the material on which you are printing. In general, pigment-based inks are less vibrant than dye-based inks but are more durable. It isn’t necessarily water soluble, which means it typically will not smudge when exposed to water. It is also resistant to fading when exposed to sunlight. Therefore, pigment-based inks are good for durable or long-lasting applications. The durability of pigment-based inks also depends on the material or substrate on which you will be printing. For example, using Avery UltraDuty GHS Chemical Labels (for inkjet printers) results in extremely durable labels that are waterproof and very resistant to a wide variety of chemicals including harsh chemicals such as Acetone, MEK and Toluene. These labels are also resistant to UV fading and abrasion. UltraDuty GHS Chemical Labels pass the BS5609 Sec. 3 certification for print durability on a variety of inkjet printers. 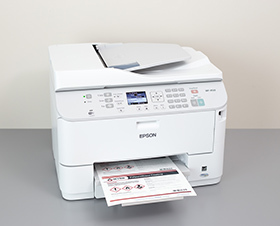 You will find that many home-based inkjet printers use dye-based inks, while many office-grade inkjet printers use pigment-based inks. For a list of pigment-based inkjet printers, see the table below. This list may not include all pigment-based inkjet printers. Please check with your manufacturer. Create perfect, laminated labels every time—no lamination machine required. Avery Easy Align Self-Laminating ID Labels come with a clear laminate that’s easy to apply. With the Easy Align design, you can create perfect, laminated labels without bubbles or wrinkles. Design your label with the FREE Avery Design & Print software at avery.com/print. For more information on Easy Align Self-Laminating Labels, click here. Fill out the form below to receive a FREE sample of our Easy Align Self-Laminating Labels. Please allow 2-3 weeks for your sample to arrive. Limit one sample per person and one sample per household, while supplies last. Offer good in the Continental U.S., Alaska, and Hawaii. Offer void where prohibited, taxed, or restricted. We received your request for the Avery Easy Align™ Self-Laminating Labels sample. Your sample should arrive in two to three weeks and we can’t wait for you to try them. For more information on Avery Easy Align™ Self-Laminating ID Labels, visit avery.com/EasyAlign. Your product packaging is one of the first things a consumer sees when they shop. With only seconds to capture their attention, your label needs to make a good impression, fast. If the window is not redirected, please click here to download the eBook.